Animals footprints are called tracks. At the MEEC you can find tracks of deer, beaver, ducks, dogs, squirrels, geese, turtles and even snakes. Tracks are usually found in the soft sand along the trails or in the mud near the ponds. As you walk the trails, look for tracks. You may see tracks that look like little hands! To identify tracks you have to be a careful observer. Follow these steps to help you identify tracks at the MEEC. 1. Count the toes in the print. If you see five toes that look like fingers, then you are most likely looking at a raccoon footprint. It resembles a small child's handprint! 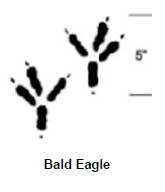 The back or hind foot print is larger than the front foot. Next look for claws. Most 5 toed prints come from the weasel family, this includes skunks. 2. If you see 4 toes, you are probably looking at a cat, dog, or rabbit. If it doesn't have claws it is probably a member of the cat family. 3. Larger front feet prints with 4 toes are usually members of the dog family. You can also see small triangular shapes in from of the print. These are claws. Dogs, coyotes, foxes and wolves all have large front feet with claws. The coyote and dog print are almost the same, but the coyote print has an oval shape. 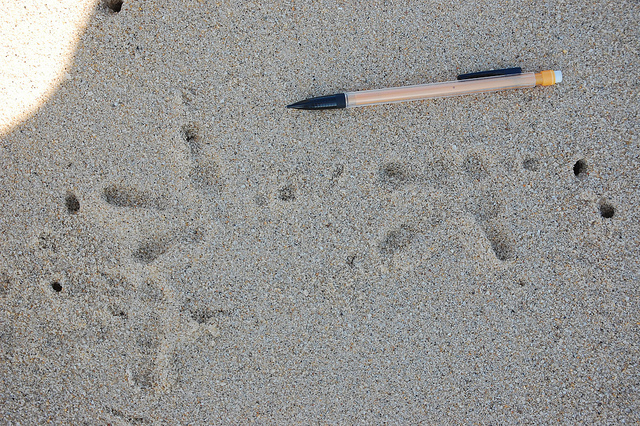 The gray fox has a large, rounded footprint. It may be 6 inches across. 4. A "Y" shaped print is usually a rabbit. When a rabbit hops, it lands with their hind feet ahead of the front feet and with one front foot in front of the other. 5. A squirrel is another hopper. It lands with its front feet side-by-side. The hind feet are larger than the front. The squirrel has 4 toes on the front feet and 5 on the back feet. Mice, chipmunks and woodchucks also have 4 toes on the front and 5 on the back. 6. Hoofed mammals like the deer have only two toes. The print of the deer looks like a teardrop. Be on the look out for these prints as you walk along the trails at the MEEC.